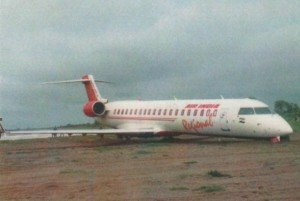 An Indian accident investigation committee published their final report into a serious incident involving an Alliance Air CRJ-700 Regional Jet that suffered a runway excursion after landing long on a wet runway. 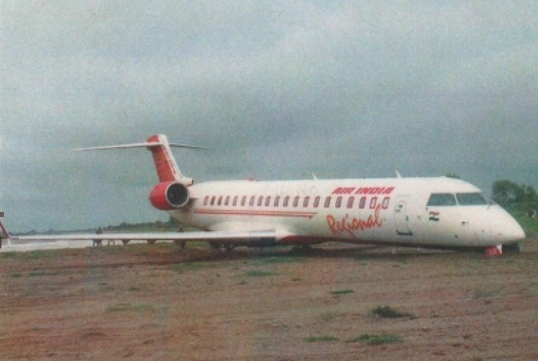 A Bombardier CRJ-700, VT-RJE, aircraft was operating a scheduled flight from Delhi-Indira Gandhi International Airport (DEL) to Kanpur-Chakeri Airport (KNU) in India. There were 55 passengers and 4 crew members on board the aircraft. The aircraft took off from Delhi at around 05:15 UTC. While inbound to Chakeri, the Commander contacted ATC at around 06:00 UTC and requested latest weather information. ATC reported weather as cloudy, overcast, rain with thunder showers and runway surface wet, visibility 2000 meters. At around 06:20 UTC the ATC reported visibility as 800 meters and as a result Commander had to execute 6 to 7 holding patterns and waited for visibility to improve. After holding for about 20 minutes the ATC reported similar weather with visibility improving to 1200 meters. Once the visibility had improved to 1200 meters the aircraft was cleared for VOR-ILS approach, landing runway 27. The VOR-ILS procedures were executed and the aircraft was configured for landing. By Decision Altitude the runway was visible and the approach was continued. While landing the aircraft floated on the runway and made a delayed touchdown past the center marker. After landing, full reverse and ground spoilers were deployed by the crew. However the aircraft kept on rolling and overshot the overrun area and entered into the soft ground area. After the aircraft went off the runway the port side wing had hit the localizer antenna and punctured a hole on the leading edge. After the aircraft came to complete halt the commander informed ATC that they have gone off the runway and required assistance. The passengers were deplaned normally from the aircraft and no emergency was declared. There was no fire. There were no injuries to any of the occupants on the aircraft. The landing weight of the aircraft was 27 ton. As per the Quick Reference Handbook of CRJ-700 aircraft for wet/contaminated runway, the actual landing distance required with full flaps is around 5000 feet. The total runway length available at Chekari, Kanpur is 9000 ft. since the aircraft landed past the middle marker which is around 4500 ft from runway 26 end. The remaining runway was not enough to stop the aircraft on the runway. The commander while landing in marginal visibility condition in rain on a wet runway with water patches floated on runway after the threshold and made a delayed touchdown. Aircraft experiencing tail wind higher than the aircraft limitation during landing is a contributory factor to the incident.